The moment Shern came into my hospital room, he said he has a present for mummy and baby. 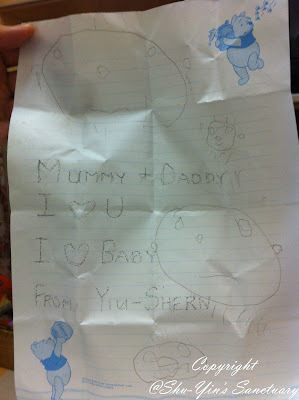 This is what Shern drew for us. (coz he remembers my big tummy during pregnancy!). The smallest face below me is baby Khye. Of course pho-pho was the one who drew the dotted lines for Shern to follow. 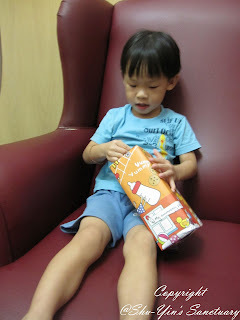 After that,we told Shern that baby Khye has got a present for him. 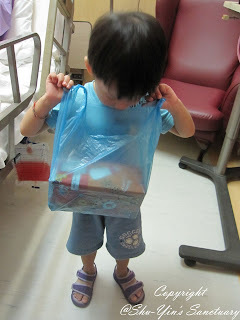 We then took out a wrapped gift in a plastic bag. (We bought the present from Tesco and had it wrapped in advance). Shern was excited as he peered inside the plastic bag. And of course, he couldn't wait to tear off the wrapper. He was happy when he saw that it is a big grey car! We forgot to take a photo of the car. 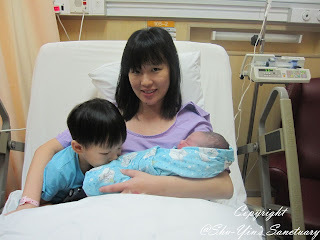 After that Shern gave baby Khye a kiss and said 'Thank You Yiu-Khye for the car!'. julia...i looked so ugly here ler.